HOURS before the arrival in Panama of the President of the People's Republic of China, Xi, Panama’s Jinping, the Chamber of Commerce, Industries and Agriculture of Panama (Cciap) gave his visit an enthusiastic endorsement. According to the Chamber’s weekly bulletin, the current standing of China in the global scene does not cause any surprise, because the country has accumulated some of the most advanced, surprising and transcendental achievements in the history of humanity. Thus, China's current preponderant role relates to a trajectory marked by thousands of years of existence. 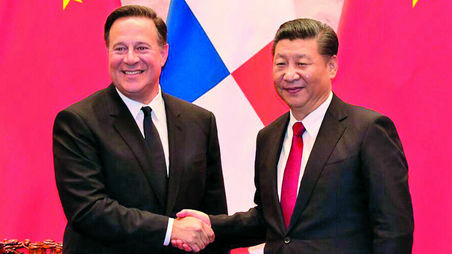 For the business association, Panama could not remain oblivious to this reality, and the establishment of full relations with Beijing, a timely decision of the national government, was greeted with a virtually unanimous thumbs up by the Chamber. which brings together in a representative manner the private business effort of the country, which has supported the government’s decision which it sees as furthering the most strategic interests of Panama. 80,000 peeps, a football stadium full, in 3 rest-belt states elected him. Not ¨we chose him¨..just the facts. The Clinton got 3 MILLION more votes. I don't believe in ideologies. I deal strictly with facts. You did not refute or comment on anything I said. It's tough when the facts contradict your ideology but you are not any different from the people in the MSM who still don't understand how we chose him over Clinton. We are certainly enjoying the fruits of our choice. "No more from me as i have made my point." Well you believe what you want . And i will do the same . Best of luck .i am not here to teach anyone .just pointing out that the net has many things we can read and learn from if one is willing to open their eyes . Good reading starts with a free ebook called ...When money dies . No more from me as i have made my point . Many more major stores will be closing everywhere as the internet changes the way people shop. Cyber Monday recorded increase in the neighborhood of 50% this year over last. This has nothing to do with the U.S. economy. Which countries are "dumping" the USD? The countries bypassing the trade sanctions are understandably doing it because they have huge contracts with both Russia and Iran. No surprise there. That's because they are putting their countries first just as America should. The USD is super strong. What are you talking about? Google ... major stores closing in the US this year . You dont get that many places going under if the economy is on a good footing . But believe what you want . Why is Europe talking about their own SWIFT system . Why are many countries dumping the USD in trade Countries that America thought were friends are bypassing trade sanctions. How much has the USD depreciated since the deal on Jekyll Island . All of us ising the USD hope for the best but one should also look at ways to protect yourself . Yes it's really spinning in the wind. LOL. The stock market still hovers at an all time high, unemployment for all races at record lows while China's productivity and overall economy is down 30%. You do realize that just saying something doesn't make it a fact? By the time President Trump gets through with China in their next meeting concerning tariffs and import / exports, you will see China take a complete change of attitude. But it won't be reported in the press that way, because like you they appear to be cheering for the destruction of the greatest economy in the world.